Antique playing cards are a unique art form that has changed through the centuries. Although the hand painted versions beloved by royalty can command thousands of dollars at auction, even mass produced cards are very collectible. Playing cards have a long and fascinating history. Although there is indication that cards were used in games as early as the ninth century in China, cards as they are known today are thought to be from the early 1300s. Playing cards immediately fascinated people as an art form and they began to show up in collections by the 1600s. By the last decade of the 14th century card use had become common throughout the European countries. These early cards were made by hand. Only royalty and the very wealthy could afford to own hand painted cards by local artisans. In the 15th century woodcut decks became more common. A technique for woodcut prints to fabric was tweaked so that it was usable on paper. The earliest known European woodcut card was manufactured in 1418. Starting in the early 1400s printed decks were manufactured in Europe by professional card makers. The decks were so popular that playing cards were almost as common a use for woodcuts as the traditional devotional images. Once the card was printed color was often added. This was hand done until the mid 1400s and then stencils were used. Another technique that was being developed was that of engraving. Engraved cards were more expensive than the woodcuts and so are very rare. In the 16th century the French playing cards began to take on a more modern appearance with the use of kings, queens, and jacks. The ace was usually considered the lowest card in the deck until the French Revolution when it was common to play cards "Aces high." 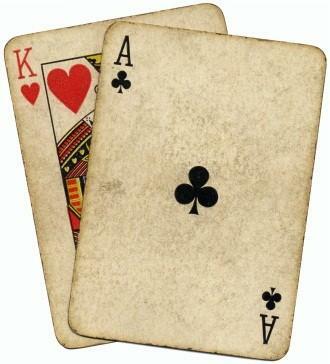 This promoted the ace to the highest spot, symbolizing the rise of the lower classes over royalty. Collectors collect playing cards in a variety of ways. The collector who collects complete decks may be interested in collecting from a particular historical period or attempt to collect cards from each major period. It can be difficult to collect a complete deck because since cards generally see a lot of use over the years there will be some cards which have been destroyed or lost. Collecting single examples of antique playing cards is possibly the easiest way to begin collecting. These are often collected for the unique artwork and designs on the cards. Single examples are generally less expensive to collect than whole decks. It is important to keep them in sleeves to keep them clean. Themed decks are collected for what is on the deck. Other collectors may collect decks with horses or other image depicted. As Issued - This would be a mint condition, complete deck that is still in the box and contains all of the original packaging. It would be unused. Mint - Complete deck that shows no sign of use. All cards are present and in the original box. Excellent - Complete deck that has been used but shows little of any signs of wear. Edges are crisp and intact. Good - This would be a complete deck that does show signs of use but is still useable. There should be no creases or bent corners. The deck should fit inside the original box which would be included. Poor - A deck that does not fit into the above categories. It might have bent corners, creases, soiling, etc. With Faults - This would be a deck in one of the desirable categories but that has a missing card or missing box. One way of dating the cards if they are still in the original box is by using the tax stamp. Here is a simple list that may help you get an idea of the dates of your cards. You will want to invest in a good price guide to help with more details about your cards. Collecting old playing cards is a rewarding hobby. It is important to store them properly in archival materials so that they are protected. In this way the cards will last for many generations.